There are some who hesitate to adopt a pet citing lack of space. And then there is Rubina Dhankar Qadir Din, who insists that her home in Gurgaon belongs to her 46 dogs while she and her husband share the space with them. The ground floor of the villa was also styled by her, but as the dogs grew in number the space appeared more lived in. As a result they decided to focus on a living space at the Barsati. The Barsati has two basic rooms, converted as a living and dining area with the open space offering outdoor seating. The two rooms in fact have been left as raw as possible, with just single brick layers of the walls, tin roofs and aluminium doors. Along with the trunk another very noticeable element is mirrors. There are at least three-four in each room along with posters and frame. For Rubina the use of mirrors came naturally, as she loves them, “I think they add character to a space, so I use them a lot. But most people can’t tell how many there are, as I place them in unique ways, each reflecting something unique, for instance the one in the living space reveals the reflection of the chandelier,” she shares. When she initially started her business, Rubina would request clients to provide dog food as payment for her services. However she soon realised that people could be quite unfair. Sometimes, she would receive only two bags of dog food as payment for the whole house. “That experience shocked me. So now I have a transparent fee structure for my interior styling services. My business really picked up after eight months of styling homes. In fact, now I am tie-ups with different designers such as Sarita Handa, Elvy and so on.” she explains. 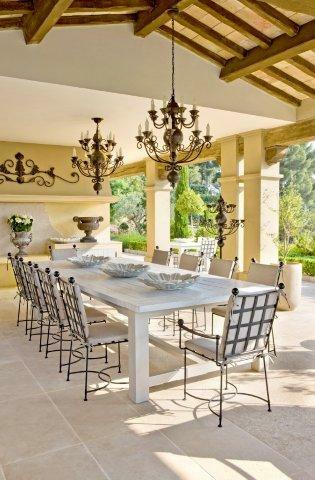 This spectacular villa designed by Kelly Hoppen and situated in the picturesque South of France near Antibes was a challenge for the celebrated British interior designer. The London based client, who had a much more traditional taste than Kelly, wanted a very classic home, something with lots of colour and something very beautiful, but not too feminine in its overall look. 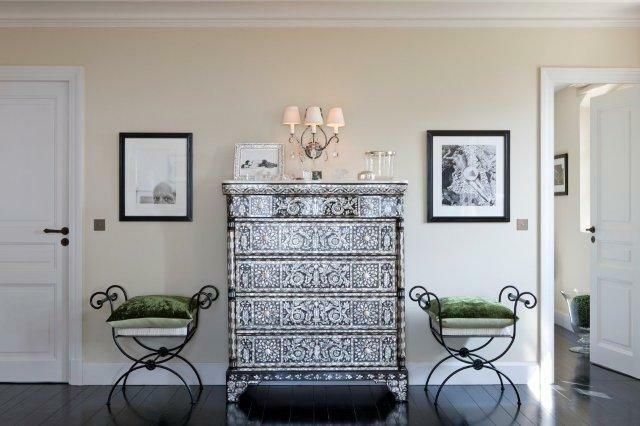 As with all of her projects, Kelly started with a neutral base and then built on this with accents of colour in each room using stunning fabrics, art and star pieces of furniture, such as the pink Moisonnier table in the entrance hall. With the eye catching pink Moissonnier table at the centre as well as the pink velvet borders on the curtains, the entrance hall is a truly unique space and quite different to anything Kelly has designed before. The clients’ favourite colour is pink so Kelly has undoubtedly remained loyal to the brief.A Birgit Israel chandelier hangs elegantly over the table and the floor to ceiling windows naturally light the room beautifully. 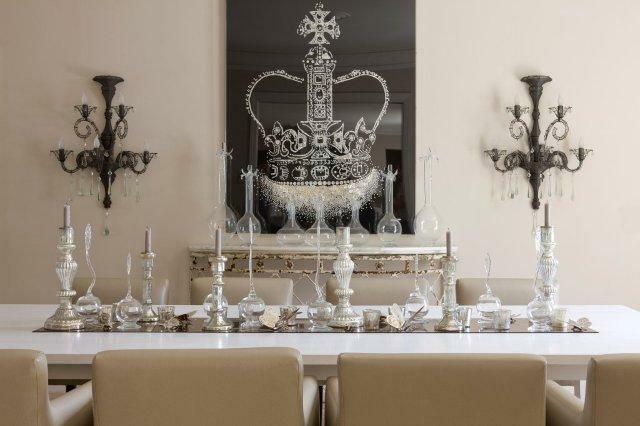 Chandelier Birgit Israel-Pink Table Moisonnier-Curtains Bennison fabrics-Sconces Porta Romana. With plenty of natural light flooding in through the large double windows, the study is a beautiful, understated room in which one can relax. The touch of orange on the India Mahdavi stools can also be seen on the beautiful vintage cushion coverings.Sofas / Cushions / Fabrics Vintage linens and tickings Armchair George Smith– Stools India Mahdavi-Coffee Table jnl– Floor Lamps Porta Romana– Curtains Ian Mankin. Kelly has elegantly designed the living room with an Andrew Martin sofa and striking black chairs from Collection Pierre. 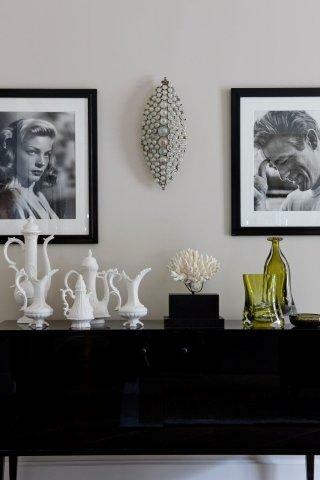 The collection of black ipe cavalli coffee tables at the centre of the room are complimented by the dramatic black and white accessories and the beautiful black and white Birgit Israel lamps. Kelly decided here to stick with her neutral colour palette as she felt the formal living spaces should be more neutral areas where the whole family and all of their individual tastes come together in a harmonious way.Sofa Andrew Martin-Black Chairs Collection Pierre-Coffee Table Ipe Cavalli furniture-Black&White Table Lamps Birgit Israel-Carpet Borderline carpets-Sconce Todhunter Earle-Art Michael Hoppen-Green Vase Kelly Hoppen. The La Fibule armchairs undoubtedly contribute to a relaxed dining experience whilst the beautiful sconce from DK Home and the candlesticks from the Kelly Hoppen store create a glamorous atmosphere.Table Guadarte-Chairs La Fibule-Sconce DK HOME-Candlestick Kelly Hoppen store-Glassware Owners own collection of vintage items. 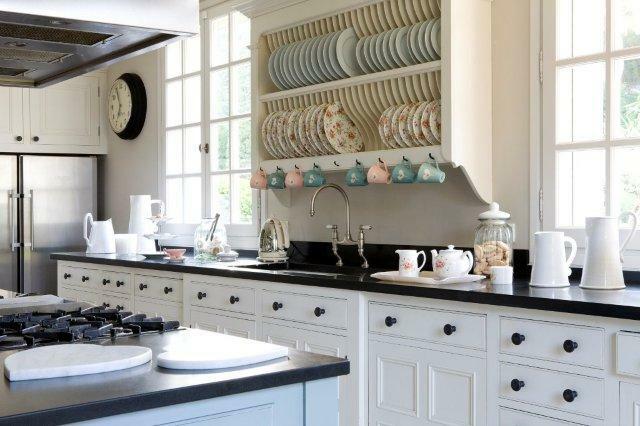 The black B/K honed slate used on the work surfaces and island provide a functional space to cook as well as making the kitchen boldly attractive.Work Surfaces B/K Slate, Honed. 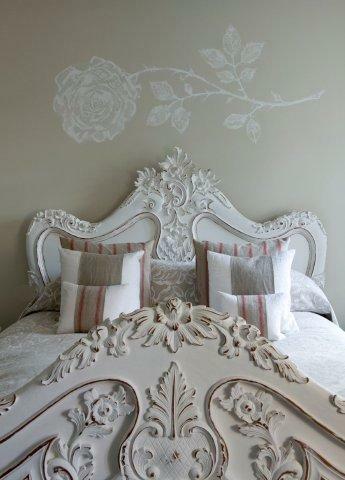 The elegantly designed master bedroom includes everything the client wished for. The beautiful green on the Meridiani bed is set off by the natural light flooding through the windows and can also be seen on the Kelly Hoppen cushions which sit on top off the Guadarte chairs.Lamps Porta romana-Bed Meridiani-Side table Guadarte-Art Michael Hoppen-Carpet Borderline carpets-Cabinet Valerie Wade-Chairs-Guadarte, cushions-Kelly Hoppen-Lighting Bella Figura-Art Michael Hoppen Gallery. 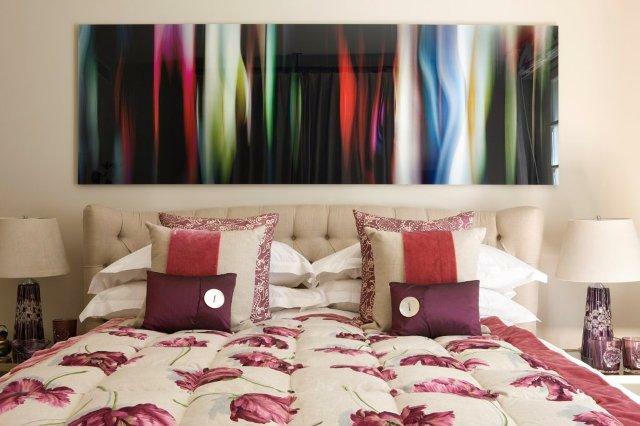 The dramatic colour Guest room 1 has been cleverly coordinated by Kelly through the unique artwork which hangs on the wall and the stunning bed linen covering the luxurious EDC London bed.Bed EDC London. The light décor in Guest room 2 and the comfortable throw covering the Meridiani bed adds to the relaxed feel of the room whilst the beautiful vintage furniture contributes to the elegant design of the room.Bed Meridiani-Furniture Vintage-Bennison Fabrics.The sumptuous Jimmie Martin bed is the focal point of guest room 3 and the ornate detailing on the headboard seems to merge with the beautiful stencil of a flower on the wall above it.Bed Jimmie Martin–Manuel Canovas and Ian Mankin fabrics. 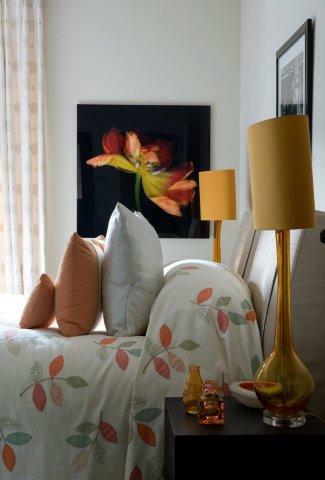 The orange running through guest room 4 can be seen in the stunning artwork from the Michael Hoppen gallery, the eye catching Porta Romana lamps and the delicate vintage glassware on the bedside table.Lamps Porta Romana-Art Michael Hoppen-Glassware Vintage-Bathroom-Curtains Chelsea Textile-Bathroom was existing. The stunning outdoors area has been designed to be a space where families and friends can enjoy food and conversation around the beautiful Heveningham dining table, whilst relishing the spectacular views from the terrace. 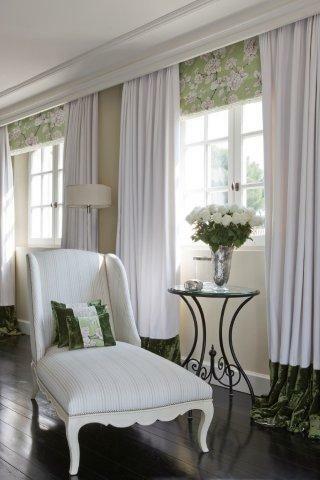 The light linen fabrics used for the cushions contribute to the relaxed feel while the ornate Guadarte chandeliers add a touch of glamour.Table Heveningham-Chairs Heveningham-Chandeliers Guadarte-Cushions/Fabric Ian Mankin and Kelly Hoppen linens-Coffee Tables Heveningham.